In Washington, apples reign supreme, providing nearly 60 percent of all fresh eating apples across the United States. Even so, plenty of apples still get left on the trees for individuals or small groups that want to spend a day or two picking apples. Farmers started growing apples in Washington state in the mid-1870s. Before 1915, farmers would dump their blemished apples in the Columbia River. George F. Miller offered to buy these imperfect apples, which he then sold to juice and fruit-canning operations. Nowadays, apple orchards dot the terrain near Wenatchee, Chelan, Spokane, Pasco and other areas of the state. Many of the state’s apple orchards are located on the east side of the Cascade Mountains, although a few apple orchards exist in western Washington. Many of the orchards give individuals and small groups the opportunity to harvest apples for personal use. Depending on the variety, apples are ready to be picked in late July, August, September and October. 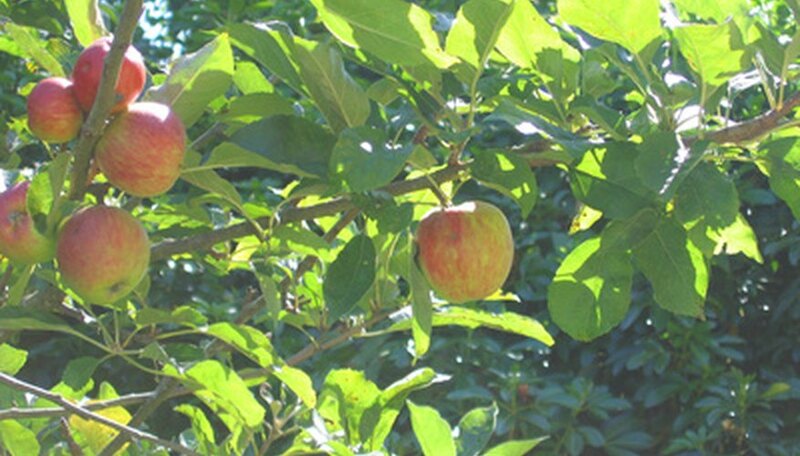 A call to the farm or orchard should help confirm the best days for picking mature fruit. The best-tasting apples get picked at the height of maturity when the sugar content is at its highest. This means the fruit easily comes away from the tree with the stem still attached to the apple. Apples are picked off the tree by twisting the apple away from the branch. Placing the apples carefully in the container keeps them from getting bruised. Apple picking can be hard work, especially for people who want to take home several bushels of fruit. Besides containers to hold the apples, sunscreen and hats come in handy to protect from sunburn. Snacks, water and maybe even a lunch packed in a cooler may prove invaluable after a few hours of work in the hot sun. For visitors who want to learn about how an apple orchard works before they pick some fruit, Washington Apple Country Tours shows visitors a working family orchard as well as a commercial packing line. Visitors then get to sample several types of apples before trying their hand at harvesting a few pounds of their own. Special events also celebrate apple-harvesting time, including the Green Bluff Apple Festival near Spokane and the Washington Apple Harvest Festival in Wenatchee.